Collagen is necessary for healthy, supple, youthful-looking skin. It is an integral part of your skin’s support system. As you age, however, your body stops producing as much, which affects your skin with lost volume, laxity (looseness), wrinkles, and dryness. When you look in the mirror, the outer you appear older than the inner you. Infini RF is an innovative cosmetic laser treatment that tightens your sagging skin, reduces the appearance of wrinkles, and improves your skin texture. By using cutting-edge technology that penetrates deep beneath your skin, Infini restores lost volume to your skin. Which Skin Conditions Does Infini Treat? If you have loose skin or wrinkles, Infini RF is effective for tightening and erasing. Your skin texture will also improve and your appearance will look fuller and more youthful. Various types of scars – from acne to trauma – respond well to Infini RF treatment sessions. Infini is fractional radiofrequency microneedling that brings you the results you want. The RF technology heats the targeted area to 60-65° Celsius; furthermore, because it’s fractional, this allows the energy to be delivered precisely into multiple zones of the area being treated. Non-fractional devices deliver energy in one large stamp, which is less efficient. 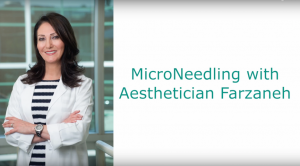 The microneedling treatment technology uses very fine needles to deliver the necessary energy to precise, predetermined depths. Not all microneedling devices can deliver such precision, nor can they be programmed for variable depths, as with Infini RF. Another aspect that separates Infini from other RF platforms is that it doesn’t start with your skin surface and then go deeper. Instead of working from the outside in, the flow needle technology starts inside the second layer of your skin, the dermis. This is where your skin’s support system lies, especially the building blocks of collagen necessary for skin tightening. When RF heat energy is delivered at the targeted 60-65° C, collagen growth is stimulated and tissue is tightened at precise depths. Infini RF can deliver various types of energy to all the levels of your dermis, which compounds the tightening and volumizing effect it has on your skin and overall appearance. You’ll love how your skin looks and you won’t be the only one! Typically, one session for your face lasts about 45 minutes. If you have your neck treated, as well, this adds about another 15 minutes. This highly effective treatment is performed only by our doctors, ensuring that you receive experienced care for your unique needs. aesthetic.lutronic.com explains more about what Infini RF can do. Many parts of your body can be effectively treated with this radio frequency skin treatment. Most of our patients undergo this procedure to address wrinkles, scars, lax skin, and skin texture on your face. Infini can also be effective loose skin treatment for your neck, addressing the effects of aging on your neck, including the “crepe” look from lost volume and hydration. It can be an effective way to rejuvenate your décolletage, an oft-neglected area affected by aging. 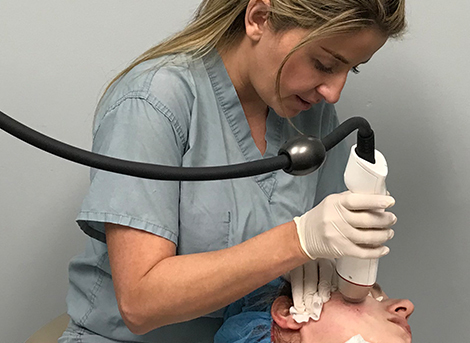 Less commonly, patients undergo this radio frequency microneedling treatment for lax skin on their arms, scars on their stomach or knee, or even stretch marks. Essentially, because of the variable settings and depths offered on the device, any part of your body can safely be treated. Because Infini’s unique process doesn’t touch the surface of your skin, post-treatment skin pigment changes are much less likely. This direct addressing of your dermis – the layer under your skin surface – means that all skin types are excellent candidates for treatment. So, if you’re of African, Asian, or Hispanic descent, Infini radiofrequency skin treatment works well for you in ways that other RF devices cannot. Many patients report very little discomfort during the procedure. The most common description is that you’ll experience a mild stinging or tingling sensation as the needles do their job. For those averse to needles or simply wanting to be more comfortable during the procedure, a topical numbing agent can be applied to your skin prior to the session. There is very little if any downtime. The vast majority of our patients go right back to their daily routine following a session. The number of treatments depends on several factors, including your treatment goals and the overall condition of your skin. Normally, however, you can expect two to four sessions, each spaced about a month apart. If you decide that Infini RF would be a good preventative measure for you, which can come from an informative and helpful consultation with us, then maybe one session a year is enough. However, if you’re undergoing Infini RF for serious acne scarring, for example, you might be in line for five to six treatments to get the results you want. In addition to Infini, we offer microdermabrasion to help improve the skin’s texture and tone. Contact Cosmetic Laser Dermatology today for more information about this or any of our other medical or cosmetic dermatological procedures. Our offices are in the UTC area of San Diego, minutes from La Jolla, Del Mar, and Downtown.